On July 7, 2014, at the age of 71, Fabio Canton expanded vitally needed behavioral health services for New Orleans area families. With the addition of a full-time education coordinator to facilitate family outreach and support through the organization he pioneered, Fabio ensured improved quality of life for many more families in need. Adding that one coordinator quadrupled the reach of an essential outreach program. 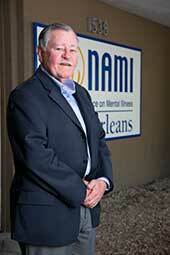 Established in 1978, the nonprofit National Alliance on Mental Illness in New Orleans (NAMINO) has expanded significantly over the years. What began as an all-volunteer organization with a single $30,000 state contract has grown under Fabio’s leadership to 39 full-time and 10 part-time employees with an annual budget of $2.5 million. Like many organizations, NAMINO was conceived out of personal experience. For Fabio, it was the compelling desire to help someone close to him. He sought answers, only to find more questions. The resources simply weren’t there – only the need. Knowing others faced similar challenges made Fabio even more determined to help. From the earliest days of NAMINO to his role today as an officer on its board, Fabio has drawn on his expertise as a partner at a large CPA firm to find funding and use it effectively to help others. Supported by his drive, compassion and experience, the tiny organization has grown into the far-reaching resource it is today. Through life experience, Fabio has learned that complex situations often require equally complex solutions and that many of today’s solutions will evolve over time. He developed a clear understanding that mental illness affects not only those afflicted, but their families and loved ones as well, and that counseling and support must be extended to all. Most importantly, Fabio continues to use his life experience to find, fund and deliver that support. Fabio Canton … Peoples Health Champion.